South Africa 4-315 (Colin Ingram 105*, AB de Villiers 65, Saeed Ajmal 2-53) beat Pakistan 190 (Misbah-ul-Haq 38, Shahid Afridi 34, Rory Kleinveldt 4-22) by 125 runs. The Proteas plundered 315 runs after losing just four wickets in the allotted 50 overs and the innings of the Green Shirts was rolled back for 190 in 36.2 overs. 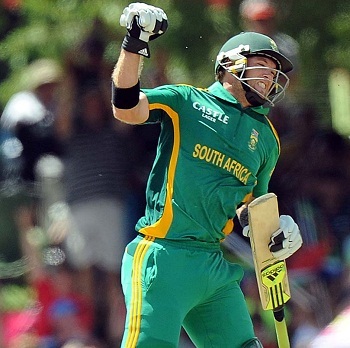 Colin Ingram (South Africa) was declared ‘Player of the match’ for his majestic unbeaten innings of 105 runs. The first One Day International of the five match series was played on Sunday, March 10, 2013, at Chevrolet Park, Bloemfontein. Misbah-ul-Haq won the toss for Pakistan and surprisingly offered the batting to South Africa on a good looking batting track which has a previous average of 320 runs in the ODIs. Graeme Smith and the world’s no.1 batsman in the limited overs game, Hashim Amla opened the innings for the home side and they survived a few anxious moments against the fast bowling especially from Umar Gul. The first four overs produced just eight runs as Amla hit 2 fours in the following overs and Smith added another two in the seventh. Amla was dropped at 15 by Mohammad Hafeez at point off Junaid Khan on the first ball of the 9th over and the pair took the score to 72 in 13.5 overs when Smith was caught behind by Kamran Akmal off Saeed Ajmal for 30. AB de Villiers, the skipper of the Proteas, walked in next and Hashim Amla became the next victim after the addition of just 11 runs to the score for 43 off even balls with 6 fours. Colin Ingram joined in next with de Villiers as the score went past the hundred runs mark in the 20th over. They kept the score board running as Ingram reached his fifty in the 32nd over and de Villiers followed him with the same result in the next over with a couple of fours. 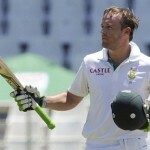 The score was lifted to 203 in 36.1 overs as AB de Villiers lost his wicket for 65 off 63 deliveries with 4 fours. Faf du Plessis was the next batsman who took guards in the center as Shahid Afridi received a harsh treatment from the batsmen by conceiving 21 runs in the 40th over. Plessis lost his wicket for 26 and was replaced by Farhaan Behardien who came in with a different intention and scored 17 runs from the first eight balls he faced with 3 fours. He dispatched 2 consecutive sixes to Junaid Khan in the 49th over as Colin Ingram powered his third ODI century in the last over with 2 fours. Ingram stood firm at the crease for 105 off 104 deliveries with 10 fours whereas Behardien scored 34 quick fired runs from 14 mere deliveries comprising 2 lofty sixes and 3 fours. Saeed Ajmal was the top wicket taker with two whereas Junaid Khan and Mohammad Hafeez shared one wicket each. Mohammad Hafeez and Nasir Jamshed went for the chase from Pakistan and scored 25 runs in the initial four overs. The latter hit 2 fours in the 6th over and was the first batsman who went back to the dressing room at 42 after contributing 25 off 19 with 5 fours. Mohammad Hafeez was going well when he was unluckily run out for 25 as the total touched 52 runs. Asad Shafiq was gone for five runs and the Tourists were struggling at 3-65 in 16 overs when Misbah-ul-Haq associated with Younis Khan. They kept on crawling and were unable to get a boundary until the 22nd over. Misbah-ul-Haq added 3 fours in the next 2 overs, Younis Khan got one and the score was enhanced to 114 in 25.4 overs as the latter went back to the changing room for 30 runs. Misbah-ul-Haq hit the first six of the innings in the 27th over and became the next victim for 38. 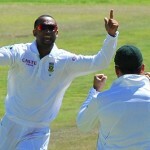 The home bowlers took charge of the situation and the wickets kept on sliding one after another. Shahid Afridi played a brisk knock of 34 from just 16 balls with 3 towering sixes and 2 fours as the entire Pakistani team was bowled out for 190 with 13.4 overs to spare. Rory Kleinveldt was the star performer with four wickets, Ryan McLaren held two whereas Lonwabo Tsotsobe and the debutant, Kyle Abbott, claimed one wicket each. South Africa won the opening ODI with a huge margin of 125 runs and leads the five match series 1-0. The second game of the series will be played on March 15th, 2013, at SuperSport Park, Centurion.